I want readers to know that God is real. Greg MacDonald is a husband, father, and businessman who grew up in the church, left it during his teens, and then, at the age of thirty-three and after a careful study of the validity of the Christian faith, gave his life to the Lord. He has a Master of Science degree in Management from the University of Idaho and a Bachelor of Science degree in Business from Purdue University. He owns and operates Sage Insurance Advisors, LLC. He is the founder of The Alliance for Seniors, board president of Northeast Indiana Long-term Care Ombudsman program, and past president of the Roanoke, Indiana Chamber of Commerce. He worked as a volunteer with high school and college youth groups for nine years. He listened and discussed the questions teens and 20-somethings had regarding Christianity. He understood their objections because when he was their age, he had many of the same objections. Greg has also studied apologetics, which he taught to adult Bible Studies. 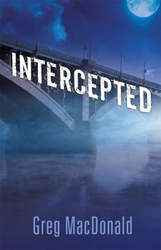 After writing Intercepted, he gave the book to several pastors and the past president of a Christian college to review and critique. All confirmed its theological accuracy. Xulon Press, a division of Salem Media Group, is the world’s largest Christian self-publisher, with more than 15,000 titles published to date. Retailers may order Intercepted through Ingram Book Company and/or Spring Arbor Book Distributors. The book is available online through xulonpress.com/bookstore, amazon.com, and barnesandnoble.com.